Music Teachers National Association is pleased to announce the results of the composition competition for East Central Division. Indiana MTA would like to thoroughly congratulate one of our students who received an honorable mention! Da Som (Emily) Yoo, student of Michael Schelle awarded an honorable mention in the Young Artist division! Congratulations to these winners/representatives of the State round of the MTNA Composition Competition. We are proud to have each piece representing our fine state in the Eastern Division Composition Competition! IMTA is thrilled to announce and offer congratulations to Julie Puckett, student of IMTA member Nien-hwa Chen, winner of the Senior MTNA National Composition Competition. Miss Puckett will be awarded $2,000 made possible by the MTNA Foundation Fund and will have her winning composition performed at the MTNA National Conference March 21–25, 2015, in Las Vegas, Nevada. We commend your hard work and encourage teachers to offer this wonderful opportunity to your students. 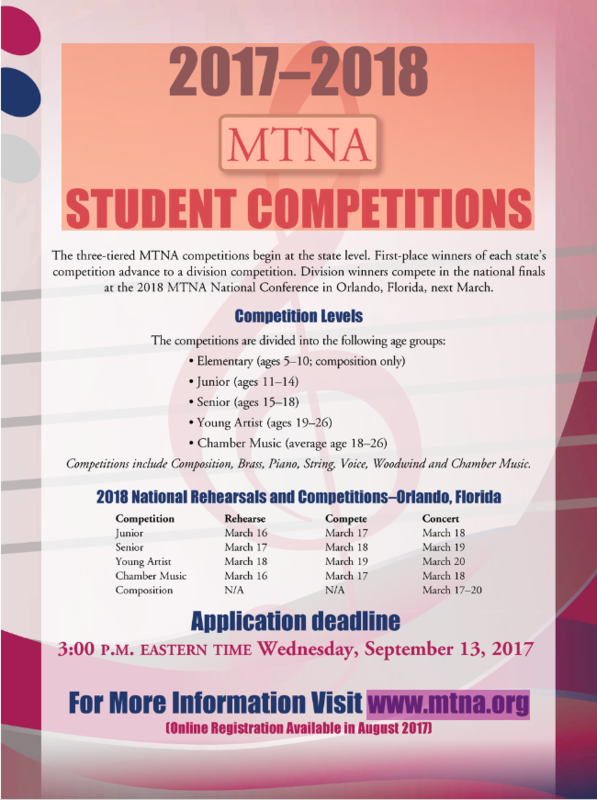 More information on Composition Competitions can be found at www.indmta.org including information on the upcoming IMTA Opus Composition Festival.